A unique concept from a wonderful idea by Dale A. Hildebrandt (with permission). 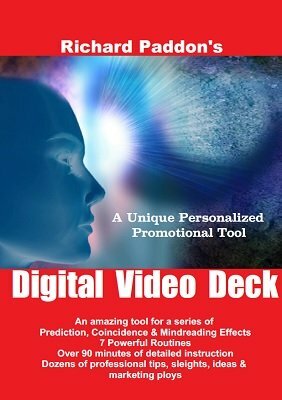 The Digital Video Deck combines a hi-tech Card At Any Number with a series of prediction, coincidence and mindreading effects culminating in a unique give-away or promotional tool. During your performance, a personalized prediction effect culminates in the spectator revealing their card at their chosen number using their own DVD player, Computer or TV. And what's more...this effect, whilst using a hi-tech aid, in no way uses technology. Clearly it is impossible to tamper with anything. Features over 90 minutes of impressive feats by Michael Weber, Daryl, Nick Trost, Sean Taylor and Richard Paddon. Sean and Richard walk you step by step through each effect with multiple methods, sleights, subtleties, hints and tips depending on your level of ability in cards and mentalism. Many of these effects are nearly self-working allowing you to concentrate fully on the presentation. DVD: Coincidence - This is the main effect of a card at selected number. Easy, self-working. Spectator has a completely free choice of any number from 1 to 52! DVD: Touched - Daryl's Untouched given the Digital Video Deck treatment. DVD: Numerology - Numerology determines a spectator's birth number. On the Digital Video Deck , this number reveals a selected card. Very easy. Includes handling tips and touches on equivoque. This effects lends itself to a short, personal reading for the spectator. DVD: Four Of A Kind - A great coincidence effect. A spectator names any number from 1 to 52. A totally free choice. Three freely selected cards are revealed to be 3-of-a-kind (say, 6H, 6S, 6D). The Digital Video Deck reveals the missing 6C using the spectator's selected number to finish the four-of-a-kind. DVD: Symbol Mystery - Dr Jak's Symbol Mystery is given the Digital Video Deck treatment. A fantastic multi-phase routine. DVD: Bluff Prediction - Based on a Michael Weber idea. Performer writes a prediction and is placed aside. Spectator shuffles the deck, deals cards onto the table and stops at any card. The prediction is a number, say 17. Card 17 on the Digital Video Deck matches the randomly stopped at card. DVD: PATEO - A so easy version of the Open prediction. Performer writes a prediction. Spectator shuffles the deck and drops cards onto the table. Spectator and performer eliminate cards until one remains. The spectator reads the prediction, which is a number. The card at this number on the Digital Video Deck matches the selected card. Totally free choices by the spectator. Includes tips and extra handlings for PATEO by Sean Taylor. This file includes 52 playing card images. These have been numbered to match the stack being used in the effects and instructions. These can be copied to a disc, computer, flash drive, etc as your prediction. The Images can be arranged in any stack or order of your personal choice. This is the climax and, quite possibly, your most interesting marketing tool. The spectator receives a disc, USB flash drive, in the mail, or even emailed to them which becomes the climax of your personalized prediction effect. A disc or flash drive can be personalised with your own advertising information. Makes a wonderful give-away with your contact information. 3. PDF with extra updates. You are given full duplication rights of the Digital Video Deck (not the instructional disc) for your own use. Plus full performance rights to perform any of the effects in any live venue, TV, radio, etc. Each effect is powerful, easy to perform, most are self-working & no memory work is required.